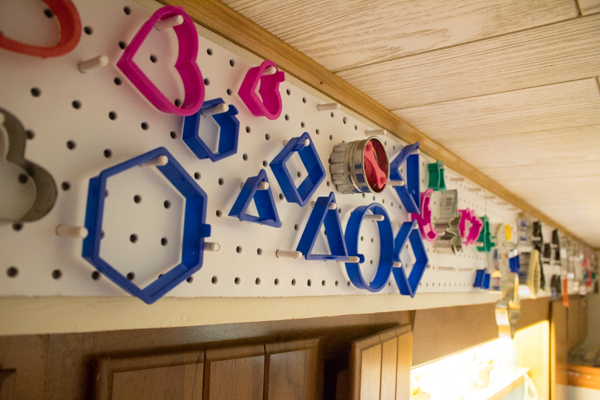 Trying to store a bunch of cookie cutters is the pits. 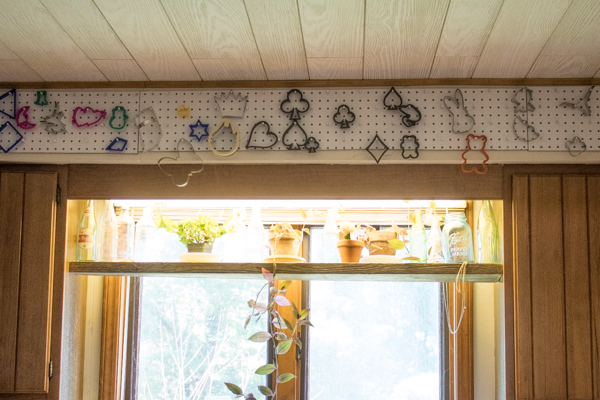 For several years, I’d been using a drawer underneath our kitchen table to hold our cookie cutters, because that’s where they all seemed to fit on the day that I first unpacked them. Of course, we’ve acquired more cookie cutters since then, dragons and castles and Girl Scout trefoils, and not only did they no longer really fit, but the kids were unconcernedly smashing them in their overarching goal of simply getting that drawer closed again whenever they dared to open it. Also, we had to dig through the whole thing just to find, say, the big snowflake, or to see if we had a star that would make a good size for a cookie wand topper. Fortunately, our kitchen also has a large, accessible, and out of the way space above the kitchen cabinets. My husband and I turned the whole area into an easy open storage system just for cookie cutters, and I couldn’t be happier with it. pegboard. 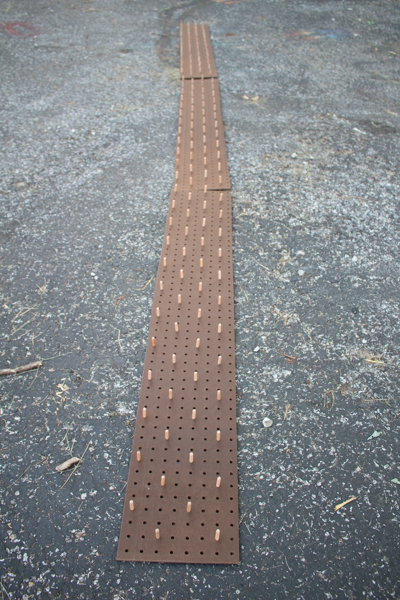 Pegboard, otherwise known as perforated hardboard, is a decently eco-friendly choice of material. It’s generally made of sawmill waste or other residual wood fibers, is adhered with resin, and doesn’t tend to contain formaldehyde. That being said, it’s a good rule of thumb to always know the provenance of your materials, so that you can double-check that you approve of the manufacturer of the specific pegboard that you’re looking at. pegboard pegs. You can buy all kinds of cute varieties of peg, but I really like these simple, American-made dowel pins. 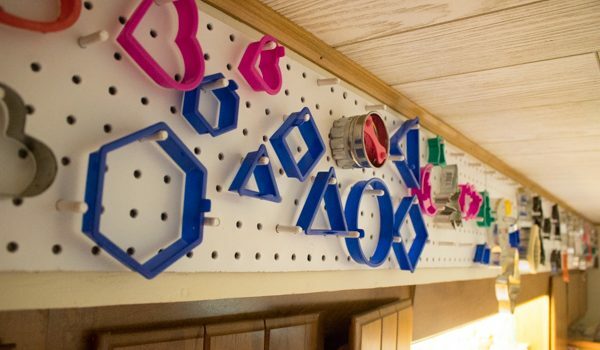 Make sure that you’re buying the correct size for your pegboard. wood glue (optional). I had this at hand, but my dowel pins fit so snugly that I didn’t need them. 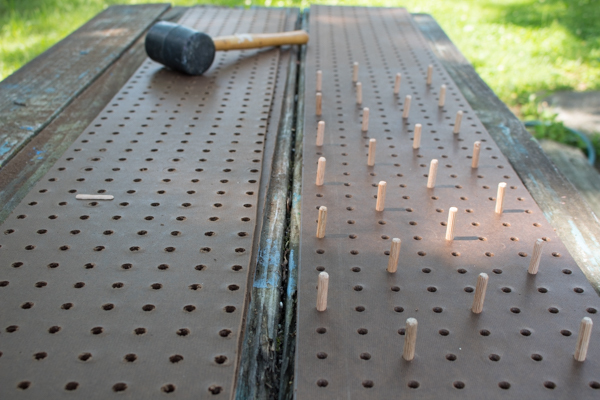 In fact, I had to use a rubber mallet to tap the dowel pins into the pegboard, they fit so well. paint. Spray paint is not great for the environment, but I’m selective in my use of non-eco-friendly materials, and painting all of those little dowel pins and all of that square footage with all of those little holes? Yeah, I used spray paint. To make the project more eco-friendly, choose a brush-on zero VOC paint, perhaps with a paint sprayer. wall hanging supplies. We tapped in nails at the corners of each pegboard, but you use the method that you prefer. 1. Cut the pegboard to size. Adjust your sizing a little so that you cut between the rows and columns of perforations. 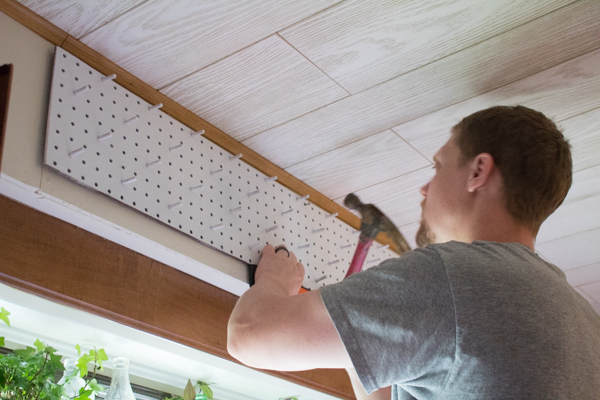 We had to piece together three sections of pegboard to cover the entire space that I wanted, so we had the additional annoying job of trying to cut the pieces so that the holes would line up perfectly across them. If you can accurately bisect the rows and columns, it works, but ours were a little uneven, so I just hung them to be even, and I didn’t care if their tops didn’t perfectly line up. 2. Add the pegs. Take your time so that you can figure out a pattern for the pegs, then push them in so that the back of each peg is flush with the back of the pegboard. I actually brought some cookie cutters out to the driveway so that I could test how they’d look with various spacing. 3. Paint the pegboard. I did my painting out on the driveway while my kid was running a bake stand out by the road and the drive-in next door had just opened for the evening–it was an absolute circus. Pro tip: if you want everyone in the universe to look at you, paint something weird in your driveway and then get people to drive by. Bonus points if you’re also taking pictures as you work, because that’s apparently also REALLY interesting to look at. 4. Mount the finished cookie cutter holder. This was too high for me, so my husband did the mounting while I stood below and assured him that he was NOT lining the perforations up correctly. I’m the only person who can tell, though, so whatever. I LOVE our cookie cutter holder! The cookie cutters would look tidier if I’d hung them all myself, but the kids actually really wanted to do it, and who am I to stand in the way of a child wanting to do a chore? It reassured me, as well, that both kids can reach even the tallest cookie cutters with our step stool, so they can still bake independently. And we’re all baking more, for the time being, while the ability to see what cookie cutters we have is still a novel thing, and the kids have rediscovered cute shapes that they’d forgotten we had. It may not be great for our ideally anti-consumerist stance, however, as the kids have also figured out what cookie cutters we DON’T have and apparently desperately need. We don’t have a dog cookie cutter, for instance, nor a cat one. The horror!